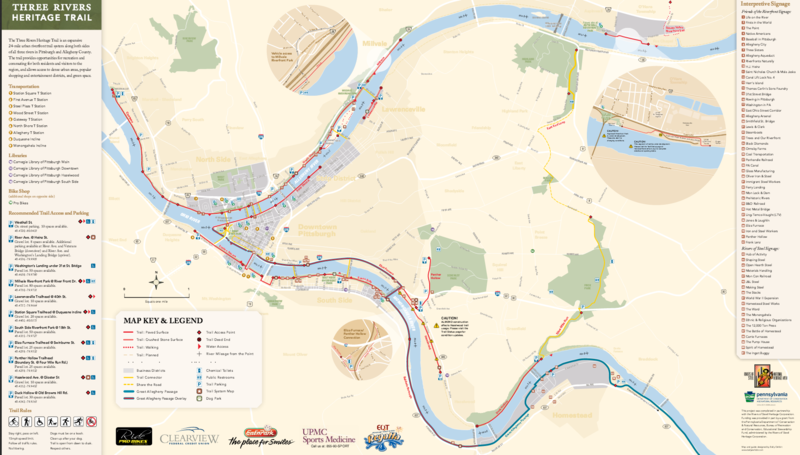 This route mostly follows the 7-mile continuous stretch of the Three Rivers Heritage Trail that covers the Strip District and the North Shore sections of Pittsburgh. The downtown section is within 1 mile of most downtown hotels (north of Grant Ave.) We chose the Veterans Bridge as a starting location, but, in reality, you can start anywhere along the Heritage Trail. The Heritage Trail runs through the Strip District and the North Shore runs by most of the major tourist attractions within the downtown area. Heading northeast for the first mile, the Heritage Trail stops for a brief moment. Take a right to Smallman Street and follow this until 31st Street. The 31st Street Bridge will take you to Herrs Island heading south west, where you can pick up the Trail again. After crossing the Allegheny River, to the North Shore, you will pass the Andy Warhol Museum, PNC Park, the Carnegie Science center, and Heinz Field. 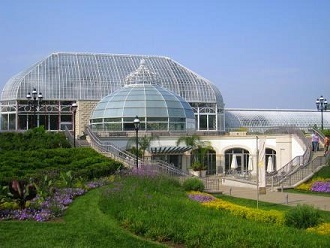 We’ve added a loop which adds a runs by National Aviary and the Children’s Museum. Another add-on is west into Fort Pointe Park (about 1/2 mile from Heritage Trail Bridge). 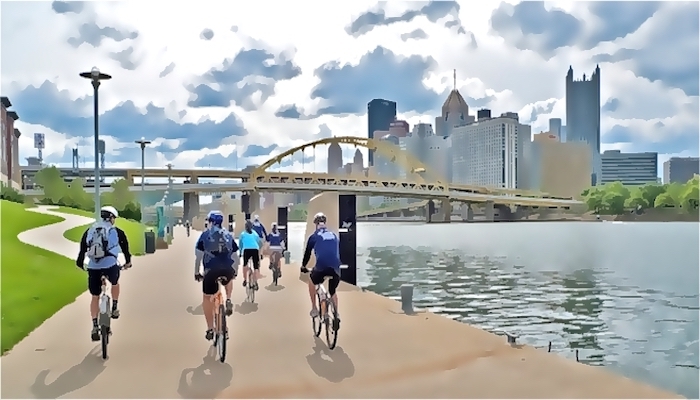 If you want to add more mileage, instead of turning right along North Shore Drive after passing Heinz Field, keep running down the trail and cross the West End Bridge. Follow the trail back and over the Fort Pitt Bridge. The trail runs alongside the Fort Pitt. 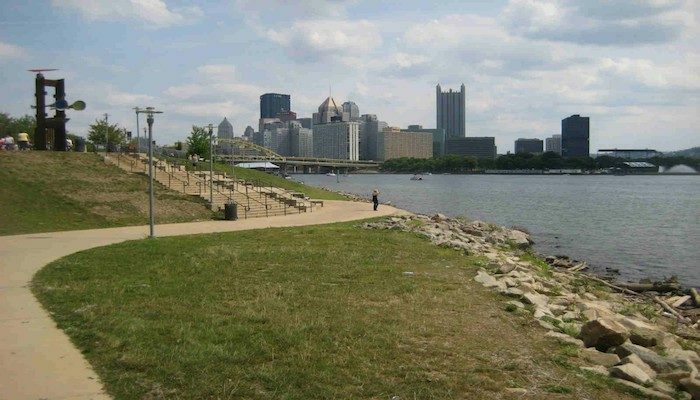 Follow the trail around Point State Park and back to the bridge where you began. Excellent goods from you, man. I have understand your stuff previous to and you’re just extremely fantastic. I actually like what you’ve acquired here, certainly like what you are stating and the way in which you say it. You make it entertaining and you still care for to keep it wise. I can’t wait to read far more from you. This is actually a wonderful web site. You actually make it seem really easy together with your presentation but I find this topic to be really one thing which I feel I’d by no means understand. It kind of feels too complicated and extremely extensive for me. I am taking a look forward for your next submit, I will attempt to get the hang of it! Oh my goodness! an remarkable article dude. Thank you On the other hand I am experiencing concern with ur rss . Do not know why Unable to subscribe to it. Is there anybody getting identical rss challenge? Any individual who knows kindly respond. Excellent post. I was checking constantly this weblog and I’m impressed! Very useful information specifically the final phase 🙂 I take care of such info much. I used to be seeking this particular info for a very long time. Thanks and good luck. I am now not positive where you are getting your info, but greatt topic. Thanks for excellent information I ussed to be in search of this info for my mission. Hello would you mind stating which blog platform you’re using? I’m going to start my own blog soon but I’m having a tough time choosing to go with BlogEngine. Hello there! This post could not be written any better! Reading through this post reminds me of my previous room mate! He always kept chatting about this. I will forward this page to him. Pretty sure he will have a good read. Thank you for sharing! Options for 5–8 miles and 8–11 mile RT.